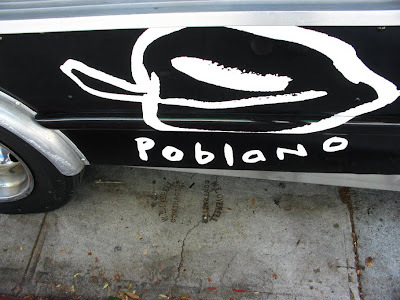 This past Saturday I headed to the Silver Lake Art, Craft and Vintage Fair at Micheltorena Elementary School for the sole purpose of finally catching the Border Grill Truck. Proceeded by quite the reputation, I was expecting some real BANG for my buck here! 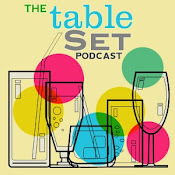 I began to get really hungry as I approached the sleek black truck, adorned with the festive, graffitti-like line art that has become an aesthetic signature of Susan Feniger and Mary Sue Milliken's restaurants' decor. Thoroughly excited by the toothsome menu chock full of yummy-sounding Mexi-delights, my friend and I basically decided we must order one of almost everything. The most intriguing section of the menu to me was titled "cones". 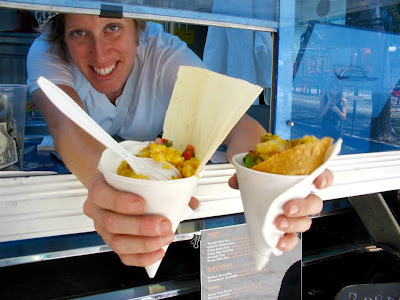 We started with the Green Corn Tamal cone (sweet corn, crema, salsa fresca) and a Peruvian Ceviche cone (mahi mahi, lime, ginger, aji amarillo chile, pickled onion, corn tortilla cone). 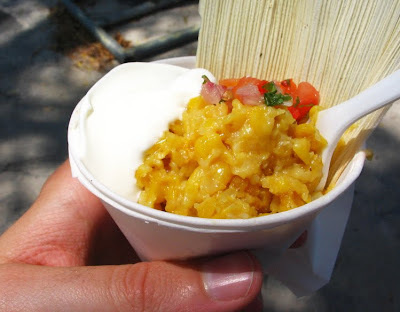 The sweet corn tamal was a tasty start, but after several bites on the palate resembled creamed sweet corn overwhelmed by crema mexicana in a sno-cone liner more than a good tamale. 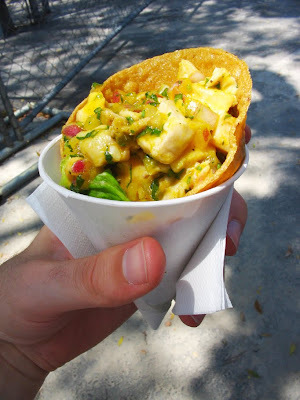 The Peruvian Ceviche cone on the other hand was the best item we sampled, the lime and ginger bursting open every tastebud to further taste each ingredient with added dimension. Delicious! 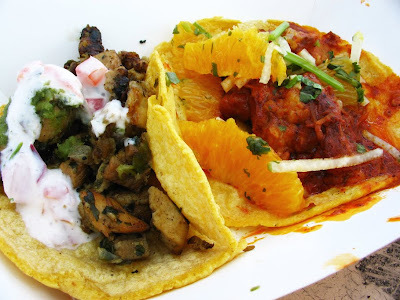 The Yucatan Pork Taco ( braised achiote pork, black beans, pickled onion, orange jicama slaw) was a gorgeous site. The meat was tender and flavorful, but the bitter/sweet orange slaw was so distracting, it literally bisected the main flavors until almost opposing. "Weird" was our mutual review. The Cilantro Chicken Taco (tomatillo, creamy salsa fresca) was tasty, although cooked cilantro never seems quite right to me. 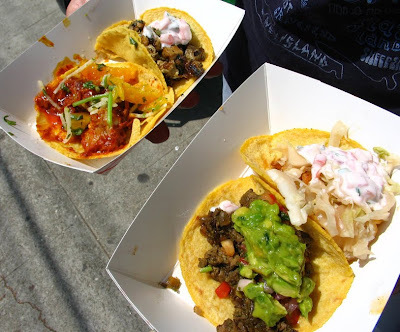 In the end, either way this taco nothing terribly memorable. Speaking of unmemorable, I unfortunately can't recall even tasting fish in the Crispy Baja Fish Taco (chipotle honey, creamy salsa fresca). The chipotle honey was a nice touch, but the creamy salsa fresca completely doused any other flavor or texture from the small bits of fish, fried dough being the most noticeable ingredient. 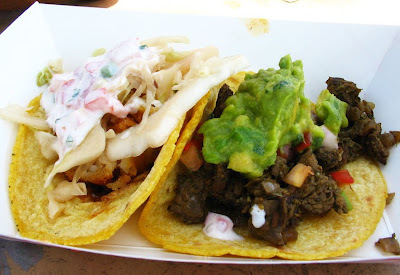 The Carne Asada Taco (caramelized onion, salsa fresca, guacamole) was par, though the meat too had little flavor. The vibrant guac on top was the tastiest ingredient here. One other unfortunate aspect, no fault of Border Grill (but apparently a rule made by the fair?) was that they could not sell their beverages out of the truck. This was especially saddening with items such as Watermelon Lemonade and Iced Mexican Coffee (cinnamon, star anise, orange zest, piloncillo syrup)... Bummer! I also had high hopes for the Churro Bites (dulce de leche infused churros, cinnamon sugar, whipped cream), but at that point opted to stick with what I know and walked around the corner instead for Alegria's Cafe de la Olla (coffee simmered with Piloncillo and cinnamon sticks) and a Lark cupcake, feeling the $20+ we spent at the truck for our somewhat underwhelming lunch was enough. 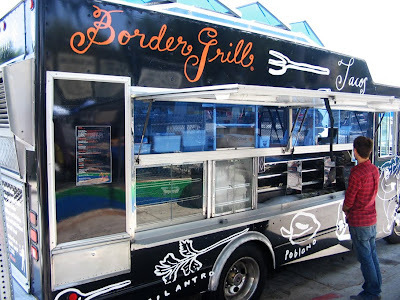 The Border Grill Truck can be found every Saturday at the Silver Lake Art, Craft and Vintage Fair. Other regular locations are listed on their site. For up-to-the-minute location, follow on Twitter.